How do you prevent the spread of typhoid among 89 students at a village school in Kenya? Install a water filter at the school to eliminate the killer bacteria and give them water that is safe to drink. But how do you spread the Gospel in the same village? Essentially the same way—through water filters. 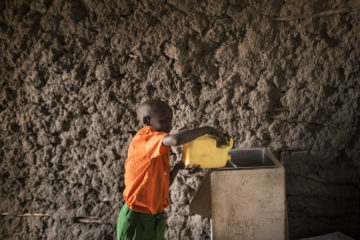 Until two years ago, the 89 students at the Biyubu Primary School off the Indian Ocean in the southeastern region of the country were plagued by typhoid fever and severe diarrhea—caused by children drinking contaminated water. That’s when Samaritan’s Purse entered the picture. We installed a filter at the school, and since then there have been no more outbreaks of the disease. Water filters not only help combat deadly diseases but also open doors for evangelism among students and families in a rural Kenyan village. Because the villagers primarily depend on water from a pond, we also gave a household water filter to each of the 54 families living around the school. We also trained members of the Biyubu Soul Harvest Church to demonstrate how to use and maintain their filters. The church is on the same compound of the school. As members visit other families in the village, they explain how Jesus is the living water—“a fountain of water spring up into everlasting life” (John 4:14). 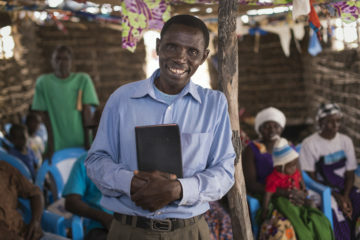 “People appreciate their water filter so much, we’re finding open doors and we’re using it as a tool to deliver and share the Good News with people in our village,” Pastor William Kenga said. Samaritan’s Purse has also erected a 300-gallon water tank at the school to collect rainwater off the roof. And we’ve provided Bibles and a new roof for the church, as well as forestry tools and tree seedlings that have been planted at the school and church. Pastor William Kenga stands inside Biyubu Soul Harvest Church that Samaritan’s Purse helped construct. Now the church’s vision extends far beyond Biyubu Village. They have a passion to proclaim the Good News of Jesus Christ to other villages. “Samaritan’s Purse has uplifted us and energized us for evangelism and teaching God’s Word,” the pastor explained. Since last December, more than 40 members and other community leaders have been equipped and nurtured through Samaritan’s Purse-supported training classes.